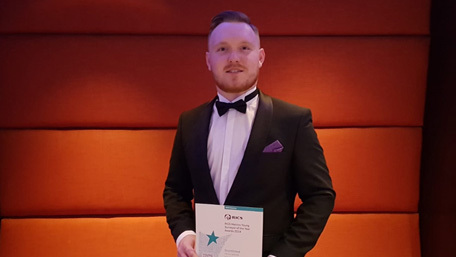 Well done to our apprentice surveyor Todd Arnison who came so close to winning a prestigious national award after being nominated as a finalist in the RICS Matrics Young Surveyor of the Year 2018. Todd attended the awards gala dinner at the Riverbank Park Plaza, London on November 30 to hear the results being announced. Sadly, he didn’t pick up the Young Surveyor of the Year award or the Apprentice Surveyor of the Year 2018 title for which he was one of 12 finalists. The awards scheme is run by the Royal Institution of Chartered Surveyors (RICS), the professional body that accredits and regulates professionals within the land, property, construction, and infrastructure sectors worldwide.